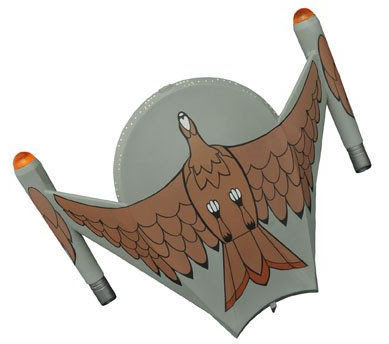 A round up of Diamond Select Toys latest Star Trek offerings today, starting with a new ship in their Starship Legends range of electronic starship models: Due out next month is the Romulan Bird of Prey, which is only the second non-Starfleet ship in the series so far (following the Klingon Bird of Prey). DST recently tweeted a new photo of the model, which revealed an exciting and attractive new feature, the ship will have window lighting! 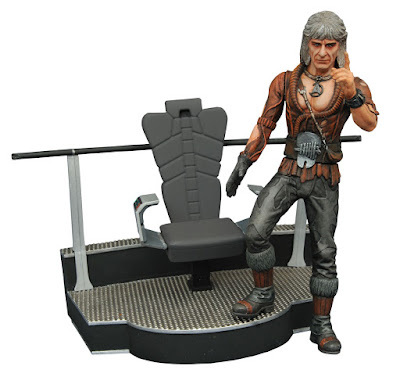 Pre-order: Amazon.com, Things From Another World, Entertainment Earth. With the initial release imminent I'm sure we can expect to see variants on the horizon (surely at least a cloaked version), and beyond the Bird of Prey the Starship Legends series is due to continue with the USS Reliant, hopefully coming next year. Meanwhile also expected in October is the latest figure in the Star Trek Select range, Khan Noonien Singh, who comes with multiple spare limbs to allow different poses, and the bridge chair from the USS Reliant to sit in. DST recently posted a photo of the packaging on Facebook, and with all those spare body parts it looks like Khans twin has had a rather unfortunate transporter accident! 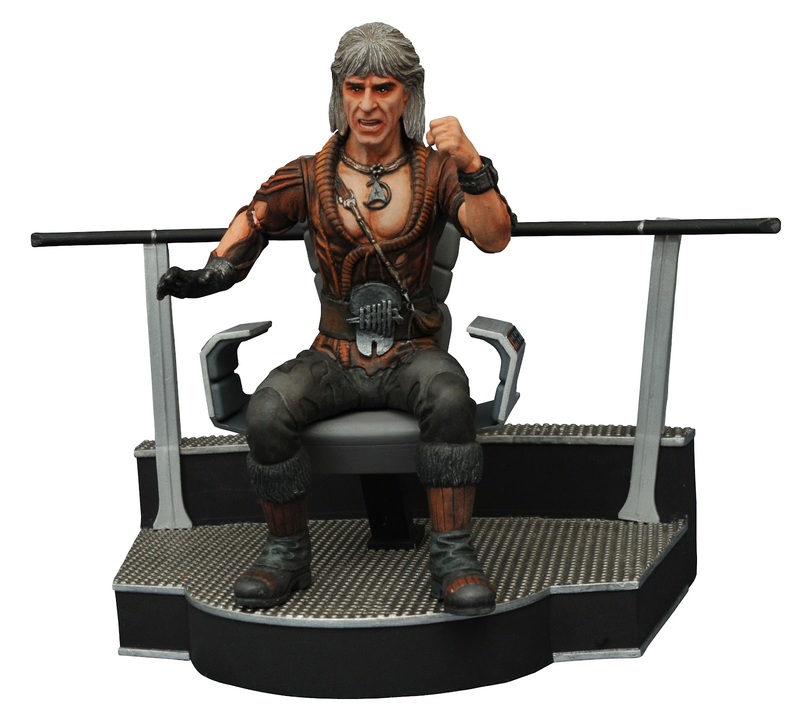 Pre-order: Amazon.com, Things From Another World, Entertainment Earth, Forbidden Planet. 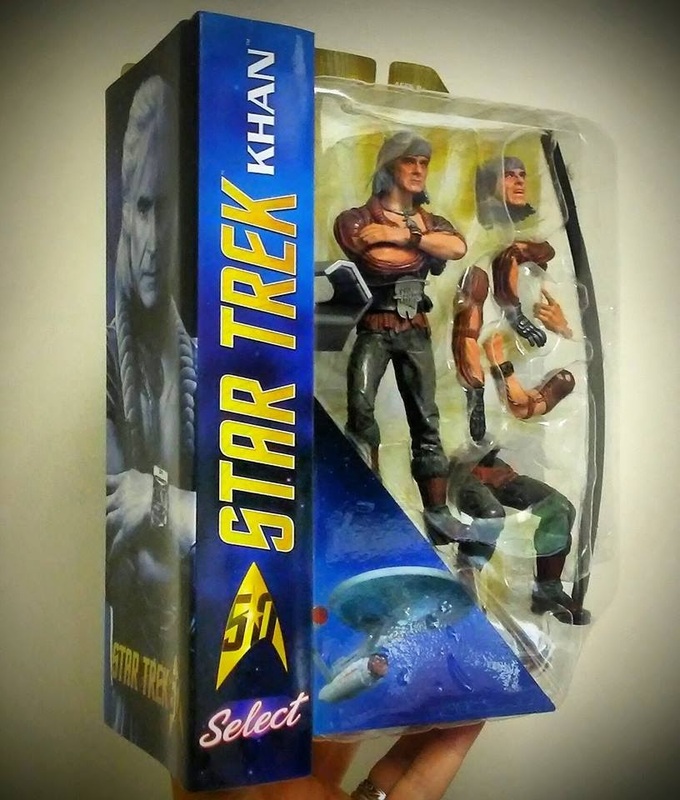 The Star Trek Select line is also set to continue, with the next figure not yet revealed, but previously hinted to be a TNG character. In other action figure ranges, already out earlier this year, DST have reissued the reproduction of the Mego bridge playset. 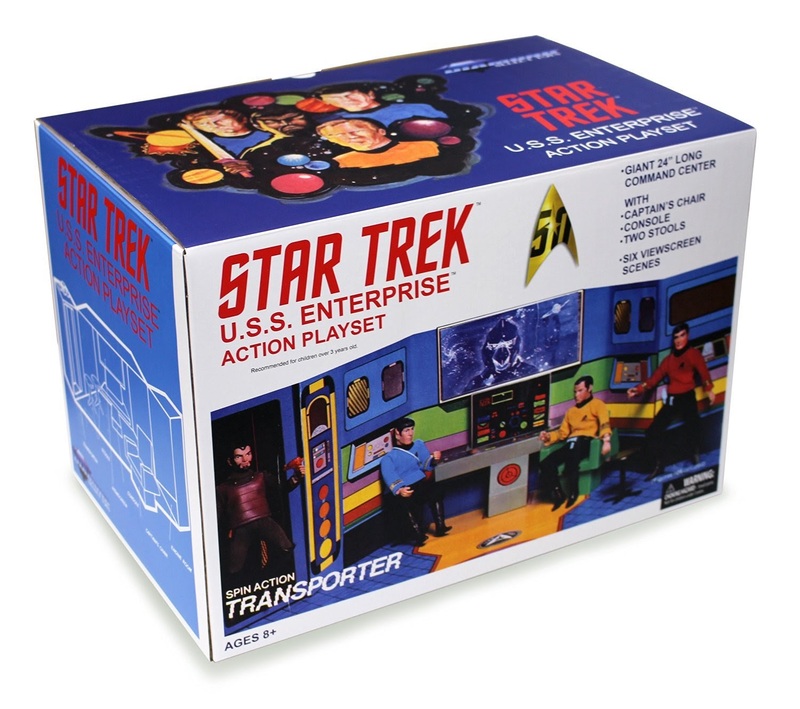 ...there was very little interest from retailers in a re-issue of the TOS retro cloth releases. We would like to find a way to release some of the new TOS figures we showed, but we have no plans for any more TNG or other TOS retro cloth figures at this point. 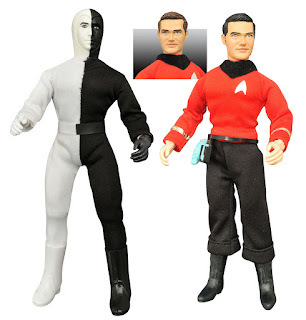 Those new figures included a generic redshirt, which was planned to be released with a couple of different head variants, and a new Cheron figure, with the black and white sides reversed from the previous release, giving you a Lokai to pair with the previously release Bele. We really would like to do something with Minimates for the 50th, but the retailers did not seem interested when we checked with them. We’ve not given up yet, but we’ll have to see. 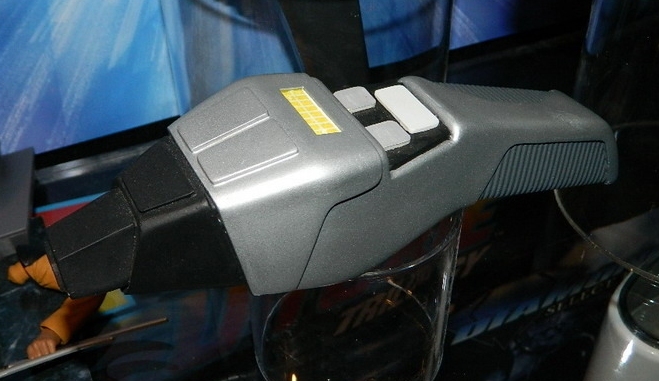 There is more hope in other areas however, while there is no release date yet, DST are still working on their latest Trek Tech prop, the TNG phaser. 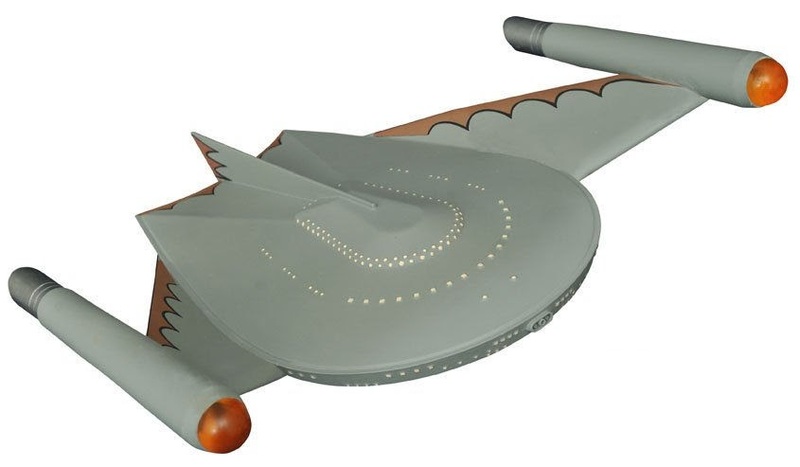 Do we know if the Reliant will be to-scale with the 1701 models (IE so they could re-use a lot of the same molds) or bigger? Bệnh giang mai là một trong những bệnh xã hội nguy hại nhất hiện này, đồng thời cũng là bệnh rất khó chữa trị. Một khi mà bị mắc nhiễm bệnh, người bệnh có thể chung sống với bệnh suốt cả cuộc đời. Hầu hết các trường hợp Chữa bệnh giang mai là nhằm để phòng tránh các biến chứng nguy hiểm xảy ra, xóa bỏ các tổn thương và biểu hiện ra bên ngoài, ức chế xoắn khuẩn phát triển… Do đó, khi có dấu hiệu bệnh hoặc nghi ngờ mắc bệnh, mọi người cần phải đi thăm khám và điều trị ngay lập tức. Để bảo vệ sức khỏe của bản thân và gia đình một cách tốt nhất. I have to ask if you're OK. The site hasn't been updated in nearly two months, and now the bots are posting comments. I am missing the updates. Something must have happened. I hope that you are well? 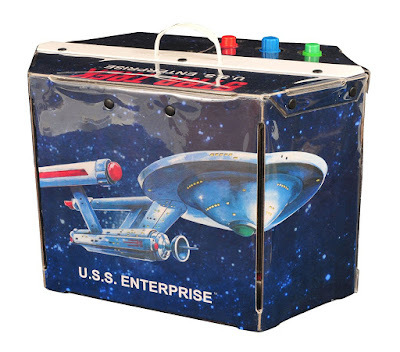 I visit this site daily and there hasn't been an update in a long while. what's happen to website, i don't read any new posts, is someone have news ? 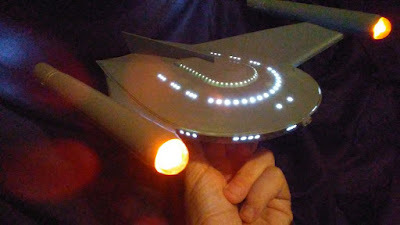 I think after a certain length of inactivity blogger will shut it down. Presumably 8of5 is not simply bored, but is either ill, dealing with personal issues, or dead (hopefully not, but it happens). Twitter, other blogs, tumblr, etc., have all been inactive for much longer than this blog; facebook link is broken. So who knows? An entire discussion on another forum concluded that 8o5 hasn't passed away. He is just taking a break for some reason. 8o5 if you read this, you should message your friends. They're worried about you. I'm a total stranger that was simply wondering if you were okay. That's a very good news. I have he will returned ang give us some news. Many other Star trek things will come in 2017 ! k shred -world today? Getting that lean and healthy and balanced and healthy and balanced personal whole body can be as simple as saying no to weight loss programs and saying hello to a getting healthily lifestyle you can call your own. Now that is something that any big brother would be proud of.iet strategy .